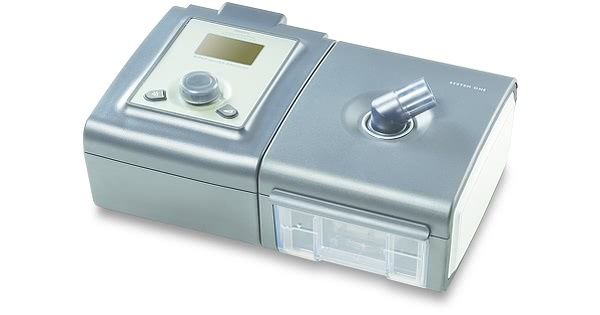 Newer Model Available: PR System One REMStar 60 Series BiPAP autoSV Advanced. The PR System One REMstar BiPAP Auto SV Advanced combines the constant support of a BiPAP machine and the accuracy of EPAP technology to continuously monitor and change based on individual needs. The system is designed to deliver therapy to complicated sleep-disordered breathing cases. This is achieved by constantly adapting to individual inhalation and exhalation needs. 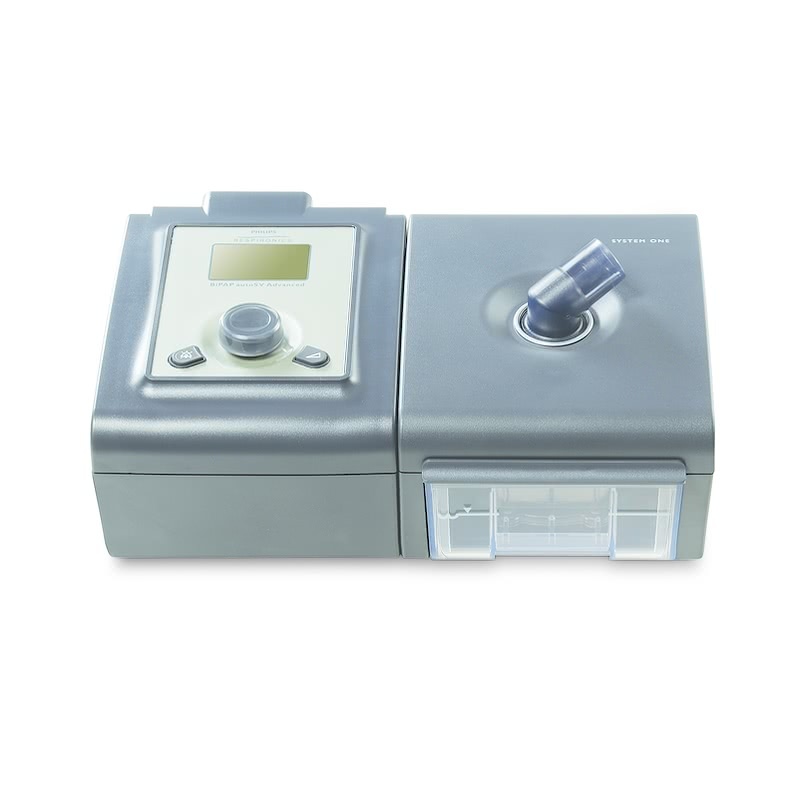 It features Bi-Flex technology and an Auto EPAP titration algorithm to support comfort and appropriately ventilate every breath. The PR BiPAP Auto comes standard with carrying case, bag, memory card, manuals and now packaged with Respironics Performance Tubing. The PR System One Humidifier and Water Chamber is an advancement in preventing water damage and a safeguard against rain-out. System One Humidity Control technology evaluates room temperature, humidity and airflow to determine the optimum humidity setting. The humidity level is closely monitored inside and outside of the machine in order to adjust for changes in environmental conditions. The Humidifier and Water Chamber also employs Dry Box technology to reduce water damage. The air outlet port is on the top of the humidifier instead of the side. The water chamber also uses a one-way valve that connects the machine and humidifier. No matter the type of mask used, PR System One Resistance Control helps to coordinate both the mask and machine to attain optimal pressure. To define variable resistance attributes, Respironics employs a numbering system on all of its masks. Each number is utilized to program the BiPAP to coordinate with each mask type. This compensates for the variance in pressures in each mask and provides a more consistent pressure. The EPAP technology in the System One aids in the observation of obstructed versus clear airways. 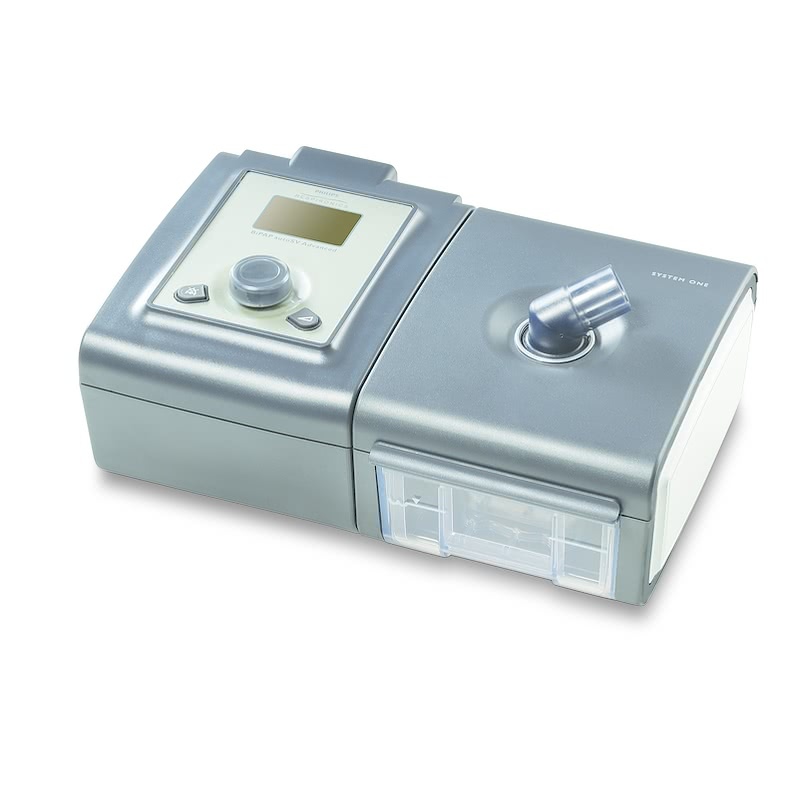 It achieves this by utilizing an Auto-titrating algorithm allowing the device to operate like an Auto CPAP or Auto BiPAP device. With EPAP, the system automatically recognizes and adjusts to any condition change (such as a drop in weight or a change in medication). Complex Sleep Apnea can develop as a result of CPAP treatment. In order to prevent this, the advanced backup rate encourages spontaneous breathing at a natural rate. This is accomplished by the system automatically calculating the backup rate to closely match the natural breathing rate. The SV algorithm of the PR System One provides a smoother breathing pattern by tracking pressure changes breath by breath and ensuring proper breathing cycles. It establishes a target peak flow, which assists in normalizing breathing patterns. By tracking each breath during three critical points during the breathing cycle, Bi-Flex technology provides constant pressure relief. Pressure is reduced by half centimeter increments during the transition from exhalation to inhalation, inhalation to exhalation and during exhalation. This provides more comfort and assists in attaining a natural breathing pattern. The Bi-Flex setting can be adjusted up to 1.5cm of water pressure for maximum comfort. The EncoreViewer 2.0 Software for Respironics Machines does not work with the PR System One REMstar BiPAP Auto SV Advanced. This system operates automatically between 110v and 240v AC. There are no switches to switch or fuses to change anywhere you use the machine. It will detect what voltage is needed and adjust to run on that power. Certain locations outside of the U.S. require an adapter plug that fits into the certain type of outlet socket. This can be achieved by using a Power Adapter Plug kit. This is the same type of plug adapter that would be used with a hair dryer or electric shaver. World Traveler Power Adapter Plugs. This machine is equipped with a DC plug on the back of the unit. The plug enables the user to connect the CPAP to an external DC battery source. The machine can be powered by plugging the 12volt DC Power Cord into a cigarette lighter plug. This enables use with any car, boat or recreational vehicle that is equipped with a cigarette lighter plug. Weighing in at only 1.16 pounds the C-100 Battery is a terrific option for travel. 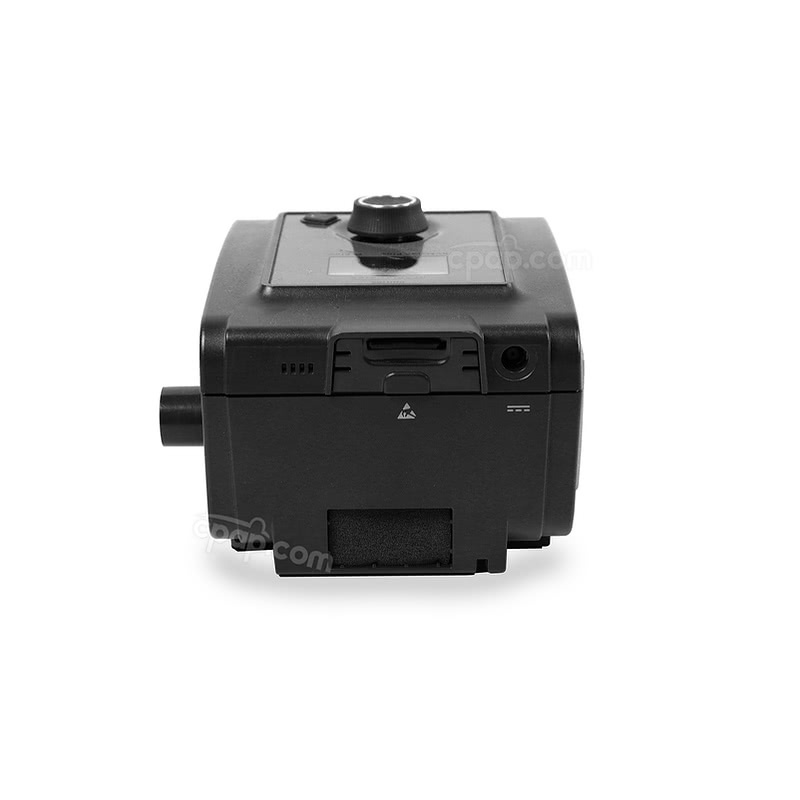 Plus, the C-100 comes with a DC cable and connector peg suitable for use with the PR System One REMstar BiPAP Auto SV Advanced so no need to purchase a separate DC cable. This lithium ion battery meets UN Manual Test and Criteria requirements for travel. The C-100 Pack includes many accessories and a handy carry case designed to allow the the cords to be attached with the battery inside the case. This portable battery pack is an external lead acid battery that is the ultimate in power, portability and convenience. This battery kit includes the Respironics battery and the 12 Volt DC Power Cord (connects CPAP to cigarette lighter socket).